1. 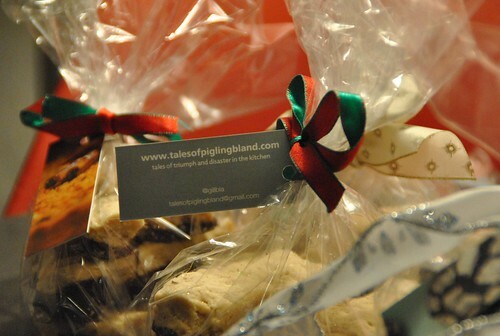 The web address of this site is now www.talesofpiglingbland.com. I find that exciting but then I’m a geek. 2. I frequently have good intentions to make homemade presents and wrap them in a gorgeous but relaxed manner. I never fulfill those intentions. It would be reasonable to think that these two facts are totally unrelated. Reasonable, but wrong. A while ago Moo.com, makers of the tiny and beautifully simple ‘business cards’, asked if I would like to try some of their mini-moo cards. I didn’t want to print a load up with the .wordpress address, so it spurred me on to finally sorting out my web address. A short visit to their website and I now have 200 tiny cards which have a range of photos from my blog printed on them. 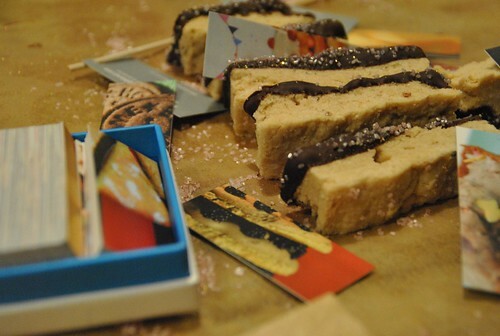 Since I am taking part in the Great Food Blogger Cookie Swap (more of that on 11th Dec but yes, it is as good as it sounds) it seemed a good chance to try out my theory that the mini-moo would make a good gift tag. Look, a proper web address! I also plan to use them as flags e,g. 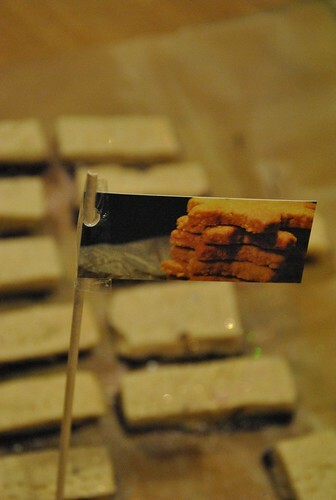 if I take cakes to a gathering and want to label them. I think they’d be good for tiny bunting too – you could cut them into triangles and thread them on daring cotton. I might even stick some round the edge of a noticeboard and keep all my blog-tasks there. Anyway, enough of my creative ramblings. I’ll probably only manage one of those. Good intentions and all that. 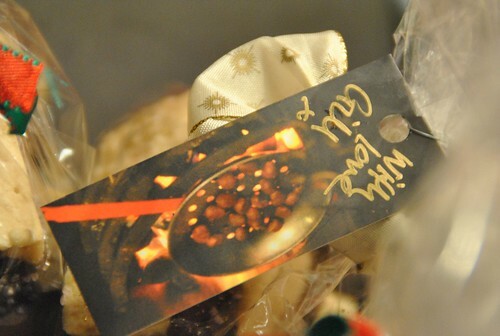 At least my FBCookieSwap had nice tags, even if my wrapping isn’t as chic as I’d like! If I put a flag on it, it’s mine! Moo have kindly agreed to give 3 people a free set of 50 business cards (normal size). 1. Leave a comment below saying what you’d write on them, or what you’d use them for (1 entry only). 2. Tweet “Business cards can be more exciting than you think. Win a set of 50 Moo cards at Tales of Pigling Bland http://wp.me/p1wtD8-z0 @gillbla” No need to leave a comment and you can do this once a day. Competition closes 15th Jan. Open to UK residents only. Moo will be responsible for fulfilling the prize and no cash alternative is available. Congrats on your .com change! I’m super pleased because now I can read your posts *ahem* on my lunchbreak! If I were to win I would probably use them for my blog which I also hope to .com over Christmas/New Years fingers crossed! I run a Creative Writing class so these would be great for handing out at events and promoting my business! I’m in the process of setting up a website and new business, so these cards would be a great start!